Papua New Guinea Communications Minister, Sam Basil, says his department is working hard to restore the use of the shortwave radio signal at the National Broadcasting Corporation NBC. Speaking in Parliament, Minister Basil says with the changing broadcasting landscape around the globe, many broadcasters are moving away from the shortwave band, while others continue to debate to keep it. The NBC's shortwave frequency has been critical during the early years of Papua New Guinea, but it is now non-existent in many provincial radio stations. Nuku MP, Joe Sungi had asked if the Department of Communication and Information Technology is doing anything to bring back this service, that serves the majority of Papua New Guineans in remote settings. 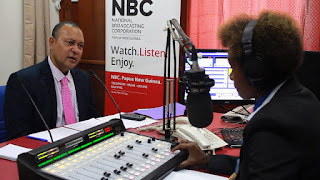 "Does the minister and his department have plans to make sure that that same service (shortwave band) can be replaced with a new one, or, an improvement can be made so that provincial radio stations can be revived and broadcasted directly from the provincial radio stations so that all parts and the remote parts of Papua New Guinea can get news and updates on whats going on? Minister Basil says, his department is working with the NBC to revive the shortwave service, further calling on provincial governments to also support the state media deliver its services. "We are all trying to bring the service back because in Papua New Guinea most of our people ol istap lo bus ples. "Ol planti radio stations nao ol istap long FM na FM emi stap long line blo sight (line of sight) na as soon as maunten i pasim, signal save stop. "So planti ol lain long ol bus ples ino wok long kisim dispela sevis, so we want to bring those services back. "Mi askim ol gavanas tu, mi laikim planti gavanas long toktok wantaim NBC na mipla mas holim strong ol provincial radio stations blo yumi. "Em mas i noken wan way tasol, we NBC tasol imas mekim. "Displa em givim sevis lo provins na ol gavanas yupla mas sanap wantaim mipla na yumi putim liklik resources together na traim long kamapim ol radio stations blo yumi ken," Mr Basil said.